The multiSUB Choice offers a wide degree of versatility. Three tray options are available - 15 x 7cm, 15 x 10cm and 15 x 15cm - allowing the choice of one, two or all three gel length options at the time of purchase. Further purchases of additional accessories are no longer required. Maximising comb and tray options allow up to 210 samples to be resolved per gel. The 15cm total run length allows restriction fragment or other close MW sample bands to be easily separated and identified. 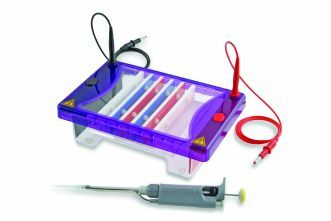 Speed loading is accomplished using 10, 14, 16, 18, 28 and 30 sample multi-channel pipette compatible combs.